Three construction workers waiting in line to buy drinks looked at me, and I could tell they were also interested. I explained that today payphones are operated by private companies and are serviced and cleaned by their owners. For a payphone to be profitable, it must generate at least $100 or more a month. I walked outside, lifted the beat-up handset to my ear and listened. When I was satisfied I had my answer, I put the handset on its cradle and went back inside. “Dead as a door nail,” I reported. One of the guys repeated my words, “Dead as a door nail.” We all laughed, and I left. I looked for the mop and payphone every time I drove by our country store. For many months the mop was there, leaning on the enclosure that protected the payphone from the weather. However, by September 2013, the mop was gone, and only the phone remained. 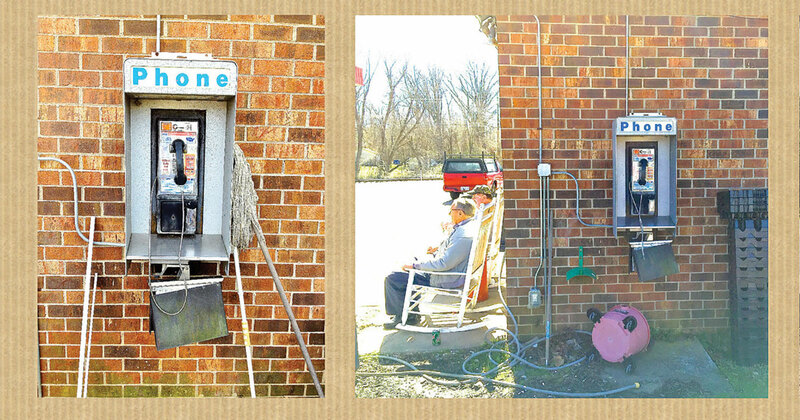 A few years later the outside of the store was completely renovated, and the payphone was removed. I wondered if they would re-install the payphone when the fix-up was done. Unfortunately, they did not. It didn’t surprise me, that’s just the way it is. In 1998 there were about 2.6 million payphones. Today, there are only about 100,000, and that number continues to diminish. All large phone companies exited the payphone business. In 2001, Bellsouth was the first to announce its exit, followed by Sprint in 2006, AT&T in 2007, and Verizon in 2011. While I do like my cell phone, it makes me sad knowing our Advance country store payphone is now just a memory, like all the others disappearing across America. The first public coin telephone was installed by inventor William Gray at a bank in Hartford, Connecticut. It was called a postpay telephone, meaning coins were deposited after the call was placed. In 1898, the Western Electric No. 5 Coin Collector, prepay station, was introduced in Chicago, Illinois. Depositing coins before placing a call became the norm in pay phones until the introduction of “dial tone first” service in 1966. By 1902, there were 81,000 pay telephones in the United States. In 1905, the first outdoor Bell System coin telephone was installed in Cincinnati, Ohio. It wasn’t an instant hit; people apparently were reluctant to make private calls on a public phone on a busy street. In the 1950s, glass outdoor telephone booths began replacing wooden ones. In 1957, calling from your car was tested in Mobile, Alabama, and Chicago. Drive-up pay telephones soon became popular. In 1960, the Bell System installed its one millionth payphone. In 1966, “dial tone first” service was introduced in Hartford, Connecticut. This essentially turned coin phones into emergency call stations because calls could be made without first depositing coins.